American crushing equipment manufacturer Lippmann Milwaukee’s 3650 modular jaw crusher has arrived on Australian shores and is now available through local distributor 888 Crushing and Screening. 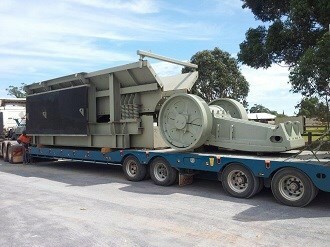 The heavy duty Lippmann 3650 Modular jaw crusher has arrived on Australian shores and will be available through WA based distributor, 888 Crushing and Screening. 888 Crushing and Screening says the 1270 mm by 914 mm machine is electric driven for reduced maintenance and downtime compared to diesel or hydraulic plants. The Lippmann Jaw is a heavy-duty 42 tonne unit which the company claims have a higher production capacity than other similar units on the market. Most jaw crushers used on equivalent track mounted crushing plants weighs only 23 tonnes. Capacities in excess of 1000 tonnes per hour is possible in certain applications subject to feed material type and settings. The 24ft long feeder unit on the crusher has a longer 8ft grizzly for higher capacity fines removal. Fully AR lined bin with extended hopper wings to suit Cat 988 size loader feed from the rear. Full hydraulic adjustment on jaw with overload protection and hydraulic unblocking. Hydraulic legs for ease of set-up. Control panel for plant operation, configured to meet Australian standards. Before its public release, the Lippmann 3650 jaw crusher had been installed in a fixed mining plant in Western Australia and has been working around the clock for almost two years. The Lippmann 3650 is currently available for sale or long term hire through 888 Screening and Crushing. Additional modular cone/screen/stacker units are available to complete the modular crushing plant. Click here to find screening and crushing equipment for sale.